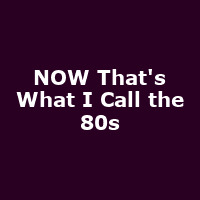 "NOW That's What I Call Music is the biggest selling compilation brand in the UK. Chart topping songs include: Relax, Uptown Girl, It's Raining Men, Gold, Purple Rain, I Wanna Dance with Somebody, Girls Just Want to Have Fun, Living On a Prayer, Come On Eileen, Africa, Wake Me Up Before You Go Go, (I've Had) the Time of My Life, The final Countdown and many more. Performed by a powerhouse live show band with sensational singers."